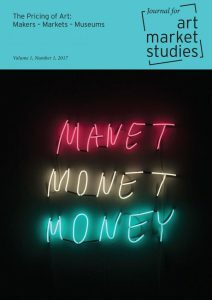 Georg Weissbach: Manet Monet Money, 2014, © Georg Weissbach, Courtesy: galerieKleindienst, Design von Amichai Green Grafik. Forum Kunst und Markt / Centre for Art Market Studies at Technische Universität Berlin is delighted to present its first issue of the Journal for Art Market Studies – JAMS. It is a peer-reviewed open-access journal for current international research on the art market of all periods. The articles are published in English. The first issue is dedicated to The Pricing of Art: Makers – Markets – Museums, the second one will be devoted to Theories of the Art Market. Who or what determines the prices of artworks, their development and volatility? The first edition of the Journal for Art Market Studies looks at how the players and institutions affect the pricing of art, its development and volatility.